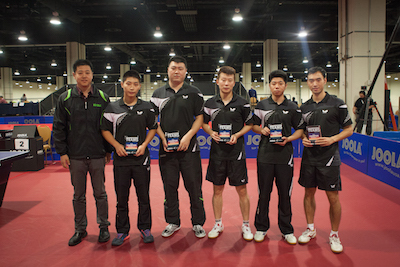 Over Thanksgiving weekend 207 teams and 825 players from all around the world traveled to the Washington D.C. area to play 3 days of action packed table tennis at the 2014 North American Teams, powered by JOOLA. The beautiful Gaylord National Hotel & Resort was the venue for this year’s competition. The 207 teams were split into 13 divisions, from beginners to world class players. In the exciting final of Division 1, Atlanta International Table Tennis Academy 1 was crowned champions, defeating Team JOOLA, 3-1. In the first match of the final Zhang Chao defeated Chen Weixing, 3-0. In the second matchup, Aruna Quadri tied it back up by defeating Xu Ruifeng 3-1. In the third team contest, Lin Chen was able to overcome the Veteran Joerg Rosskopf, 3-1. In the 4th and last matchup, Zhang Chao was able to secure the win for his team by defeating Aruna Quadri 3-0. We all may not celebrate Thanksgiving in a traditional way, but we’re thankful that all the players and spectators have made table tennis with us a tradition for 17 years. We’ll continue to work hard and we look forward to making next year the best one yet. Below are the results of this year’s 2014 North American Championships, powered by JOOLA. This entry was posted in 2014, North American Teams, Tournaments. Bookmark the permalink.